Students today may not know that their predecessors were responsible for bringing the Reverend Dr. Martin Luther King, Jr. to campus twice in the 1960s. The first time was in 1961 for an event sponsored by the Religious Activities Commission. Articles in The Argus and Wesleyana offer details. In a Letter to the Editor published a week after King’s assassination, IWU alumna Sara Ellen Long recalled her role in the 1961 group that invited King (April 12, p. 2). 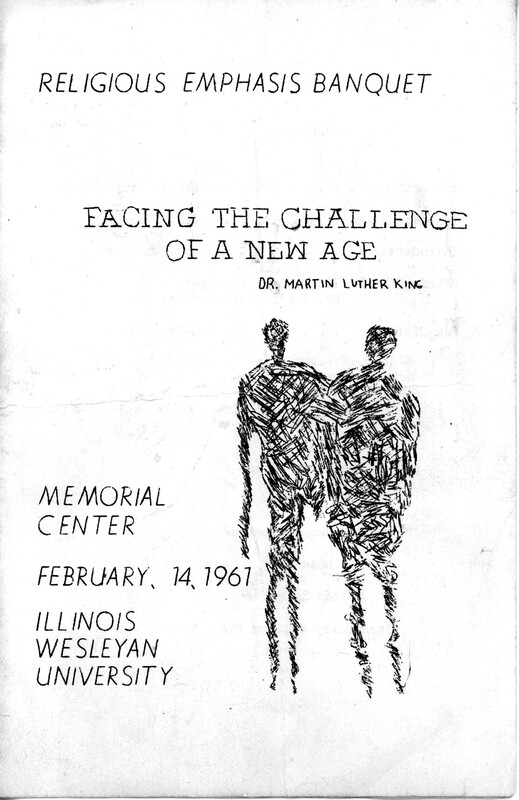 The University Archives received a special copy of the program for this event just a few years ago. The story of how this artifact came to the archives is told below the pdf version of the program. Dr. King visited a “Principles of Sociology” class during this visit and is shown below talking with Sociology professors James K. Phillips and Emily Dunn-Dale. 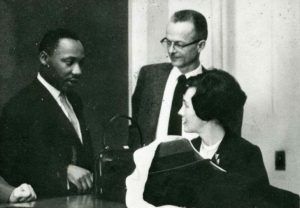 Dr. King with IWU faculty during his 1961 visit. 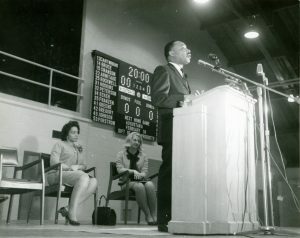 Dr. Martin Luther King Jr. is shown here with Coretta Scott King and Elizabeth Lindblom on the speakers’ platform. 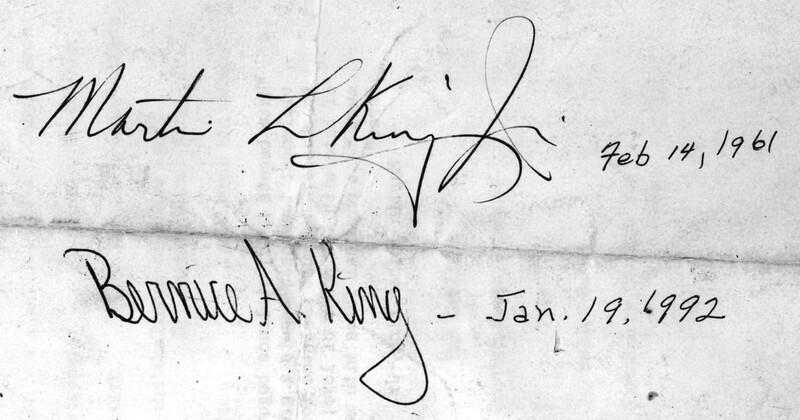 In 1966 Dr. King returned at the request of the Student Senate’s Convocation Commission. This event took place after Dr. King was awarded the Nobel Peace Prize and was held at the Fred Young Fieldhouse to accommodate the crowd. IWU student Elizabeth Lindblom was Chair of the Commission and provided an introduction to the event. Other photos from the 1961 and 1966 visits are also available. Alumni shared their reflections on these visits during a panel on the topic at Homecoming 2016. University Communications maintains a series of web pages with a transcript of the 1966 event and a link to a recording of a broadcast from local radio station WJBC. 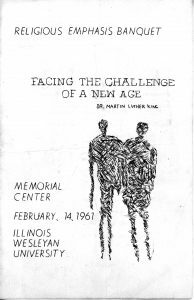 The University Archives holds an audio cassette tape of that broadcast, photographs and the other records of Dr. King’s two visits to IWU. This entry was posted in Research files, Students and tagged activism, audio recordings, photographs, primary sources, student groups by Meg Miner. Bookmark the permalink.